Enhance creativity and see the “Big Picture” – GemPowerment. Reveal your light. The many colors in these “Rusty” Quartz rectagles come from inclusions at the molecular level of minerals (i.e. titanium produces the pink color in rose quartz), along with oxidation of ferrites to produce the “rusty” look. Quartz itself vibrates to the number 4. As per the above, Rose Quartz is pink in color due to titanium inclusions in the matrix. Rose Quartz has been known by healers throughout the centuries as the stone of unconditional love. In order to love others, one must first love oneself, so this stone is said to encourage self-forgiveness and acceptance, which is the precursor to this. Rose Quartz also brings emotional harmony to the wearer, and can help one restore a calmer state after a time of chaos or crisis. It is excellent for balancing yin/yang energy, especially in those circumstances where the feminine aspect is suppressed by the masculine. Rose Quartz vibrates to the number 7, the number of the divine.The small purplish spheres in the necklace are Botswana Agate. This type of agate comes only from Botswana, Africa. It is a very powerful stone which assists to further one’s quest toward an enlightened state and helps the wearer recognize that Love is the only Universal Constant, and connect to that in all situations. 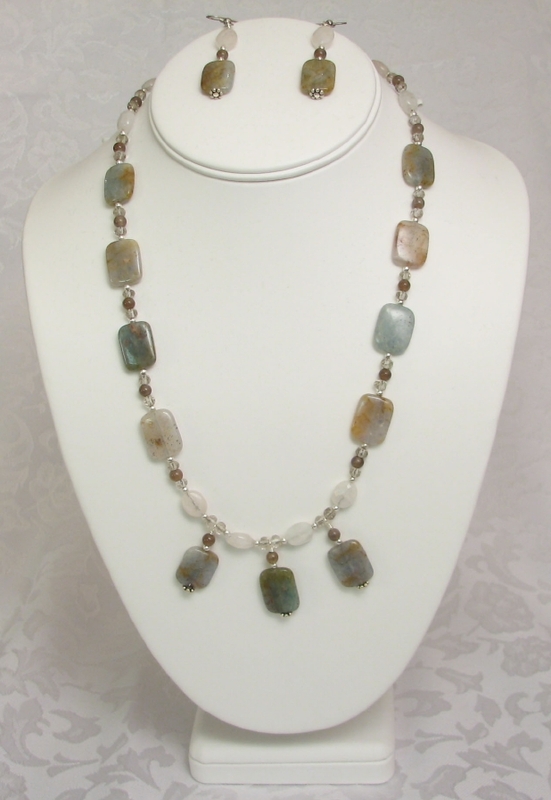 Botswana Agate enhances creativity and encourages conscientiousness in tasks, increasing attentiveness to detail while maintaining the ability to see the “Big Picture.” This stone helps the wearer look toward a solution to a problem, rather than dwell on it, to move forward. This stone is particularly good for those leading teams toward a common goal with integrity. Physically Botswana Agate helps relieve depression, especially of the kind caused by stress at work, and stimulates the crown chakra. This stone vibrates to the number 3. 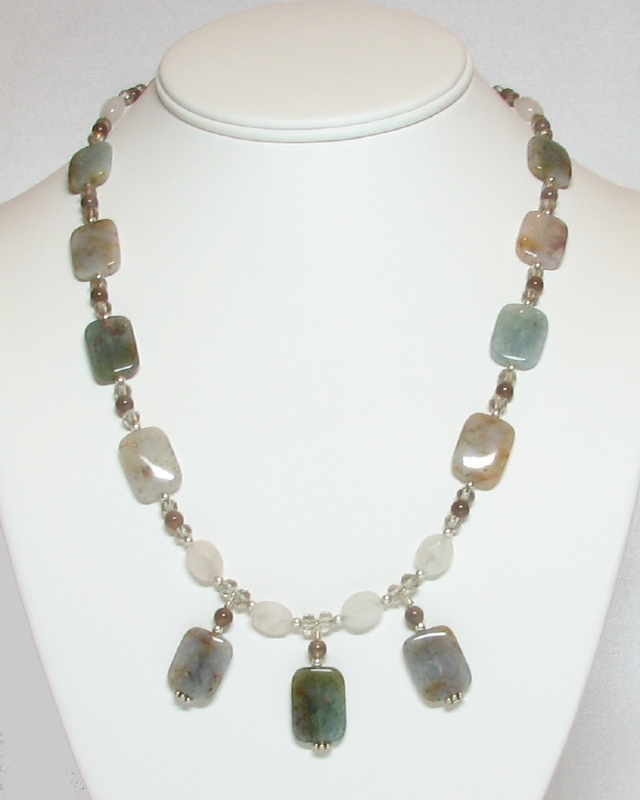 Eight is the prominent number represented in this piece: 8 each of the Rusty Quartz and Rose Quartz pieces in the main necklace, plus 8 spheres of the Botswana Agate on each side of the necklace. Eight is connected to material success, abundance, and power. This is a perfect piece to “program” and wear at presentations and important meetings to augment one’s abilities, to appear more capable and confident, and make good business decisions. The number 3 represented by the pendants lightens the mood by bringing in the vibration of joy and sweetness.